First of all, congratulations go to Anne W of Mercury – Handmade Fashion for winning the Textile Visionaries giveaway. And, it sounds like she may be generously gifting it to her daughter who’s currently studying textile design. How perfect, right? I hope Anne’s family gets lots of enjoyment and inspiration from this book! 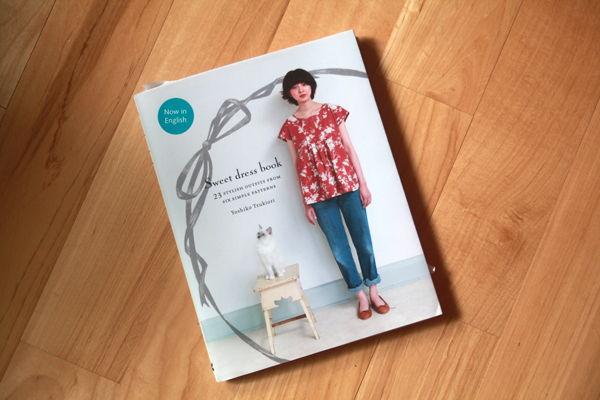 Now, I’d like to also introduce you to another of Laurence King Publishing‘s books, Sweet Dress Book . 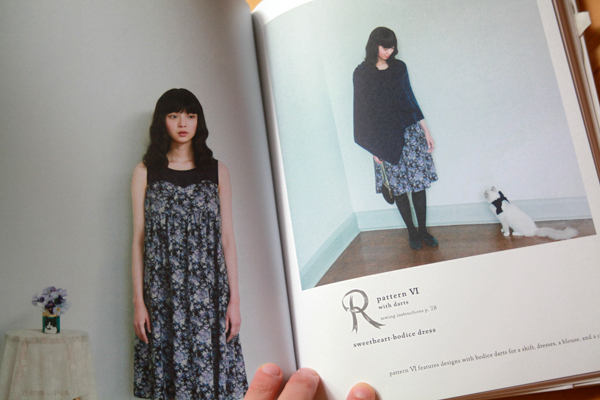 This book has patterns and instructions for 23 garments based around six basic patterns. 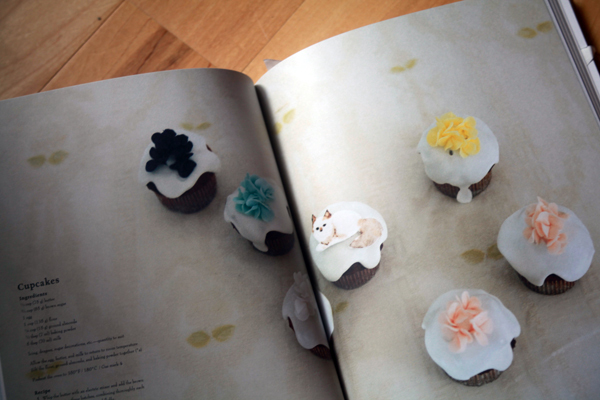 It also has kittens and cupcakes – what more could you want?! And, by cupcakes I mean it actually includes a full-on recipe for cupcakes. Talk about putting the sweet in Sweet Dress Book! I’ve started working on a garment based on the sweetheart bodice dress “R”, which is itself based on pattern VI, the basic bodice pattern with darts. But, I’m not sure it’s going to work out. You see, the particular garment was supposed to be for the Sew Weekly Reunion. Now, before I get to the problem, I want to give you a bit of back story. 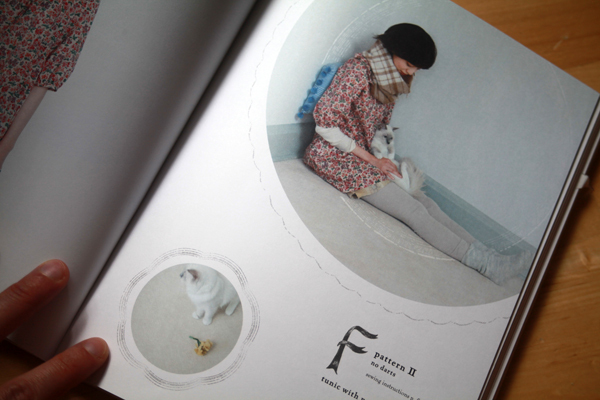 Back in 2011 and 2012 I participated in the Sew Weekly whenever I could, which worked out to eight weeks both years. I was excited to learn earlier this year that the ladies who made the Sew Weekly so awesome during 2011 were hosting a reunion. The theme was to sew a garment based on Pantone’s 2013 fall colors. I dug through my stash and found a “turbulence” gray curtain that I picked up at FabMo, and I thought, “Perfect! Those Sew Weekly ladies were always using things like curtains to make awesome garments. Reworking this curtain into the sweetheart bodice dress will be great for this year’s reunion.” So that the sweetheart bodice would stand out, I paired it with a stretch mesh from Tessuti that included a bunch of the other fall colors, which I underlined in silk organza for structure. After tracing the pattern, I made a few adjustments after tissue fitting: I lowered the sweetheart line and the empire waist line, I converted the gathered skirt into a peplum, and I added an invisible zipper into the left side. 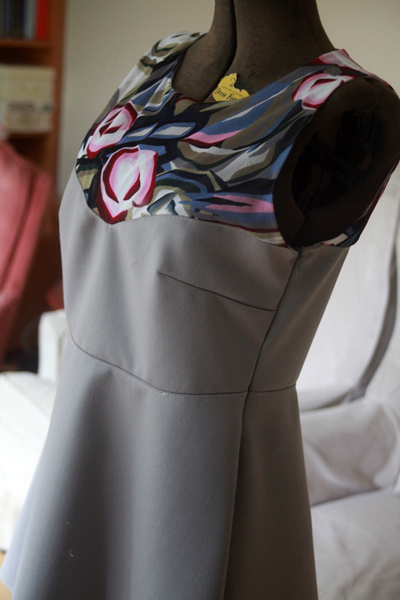 Sadly, though I think it looks cute on my dress form, the stiff gray fabric does not want to be a bodice. Wearing it is a constant reminder that it was meant to be a curtain, that it wants to be a curtain, that it’s so very sad it’s no longer a curtain. To prove it’s point it won’t hold a good press for anything. In the hopes that I can still make something wearable for the Sew Weekly Reunion, this particular garment has been pushed to the side. Potentially only to have its zipper, mesh, and organza harvested sometime in the future. (I plan on using the mesh for undies, so small pieces will be fine. And, small pieces of organza are always useful!) But, I promise that the pattern was going to be cute if only I’d used a simple cotton like the book suggested. Or, at least something other than a curtain! So, two thumbs up for the Sweet Dress Book, but two thumbs down on the curtain-to-bodice attempt. Have you ever made a really bad choice in fabric? Share, please, and help me feel a little bit better about all the time I spent making this disaster! UPDATE: If you want to see the completed sweetheart peplum, click here. Next Post Mayday! Mayday! Rushing through projects?! I am not sure where the reunion is but the Seattle Art Museum has a fabulous exhibit on Japanese fashion. Half of them aren’t remotely wearable! Fascinating runway fashions. The dress looks cute, too bad that fabric didn’t work. Awww man, that’s no fun. I haven’t really had this experience, but I’ve definitely used fabrics that I didn’t know how to handle and screwed them up pretty badly (see: The Great Taffeta Debacle of 2012). I hope you’re able to salvage what you can from the dress because it really looks cute! Totally! Made a dress out Of home dec fabric… It was so stiff… I knew it wasn’t suitable but loved the print. Right now I’m making a knit top out of heavier jersey from the stash… I was determined to use what I had though I knew it wasn’t the correct choice. It’s still wearable but doesn’t drape as much. Two more: silk skirt and light linen skirt without any lining or underlining. Hope it will make you feel better 😉 I love the fabric combo and pattern you chose! Have I ever made a bad fabric choice? Frequently. Stiff fabric is the worst – what is it good for? Blinds and shopping bags probably. And don’t get me started on fabric that won’t press…. What a shame that the fabric did not work out. You sewed it beautifully and I like the idea of turning the skirt into a peplum. Messed up on fabric? Absolutely, but it was something I realized before I started sewing, thank Heavens. Oh my gosh, it looks GORGEOUS on the dress form. That’s so too bad that it doesn’t look that way on. What about if you sort of ‘rock washed’ it, i.e., washed it over and over with some tumbling items to kind of beat it up and soften it dramatically? Thank you for your suggestion! Rock tumbling the garment helped! I threw it in with a whole bunch of jeans, and now it’s much softer. The hem is still fighting me, but I’m hoping I can win out with perseverance so that I can have a garment in time for the Sew Weekly Reunion deadline! Thank you again! Ooooh, ya!! So excited that it worked!! It’s so fun when being hard on your clothes is actually beneficial rather than ruining them. And, you are most welcome, I am delighted to help. 🙂 (I am working on my Sew Weekly Reunion make, as well).